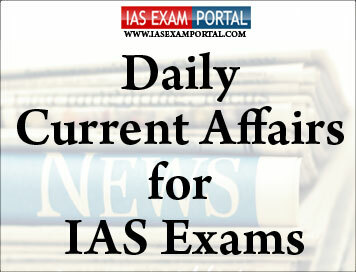 Current Affairs for IAS Exams - 09 FEBRUARY 2019 | IAS EXAM PORTAL - India's Largest Community for UPSC Exam Aspirants. Finance Minister PiyushGoyal has said, by March-April this year, India will take energy access to every single home in this country, about a decade ahead of the deadline of the Strategic Development Goals 2030. He said,Ayushman Bharat initiative will cater to about 40 per cent of all the people of India. He was addressing India Showcase event of Global Fund 6th Replenishment Meeting organised by Ministry of Health in New Delhi today. He said, the Government is working to provide free health care to 500 million Indians. He said, it will define the efforts to achieve Sustainable Development Goals by 2030 much faster than the slated time lines. Mr Goyal said, with massive scale-up of Ayushman Bharat in last four months, a million people have benefited from free health care initiative. He said, Government is aiming at creating a healthy society, with an environment of health assurance and support of necessary health infrastructure. Speaking on the occasion, Minister for Health and Family Welfare J P Nadda said, India has made significant progress in combating Malaria, Tuberculosis and HIV AIDS. He said, WHO World Malaria Report of 2018 validated India’s recent strides against Malaria. He said, India witnessed a 24 per cent decrease in 2017 compared to 2016. The Health Minister said, India has targeted to eliminate Tuberculosis by 2025, five years ahead of Sustainable Development Goal target. The Department for Promotion of Industry and Internal Trade (DPIIT) and the Central Board of Direct Taxes (CBDT) on Friday agreed to compile a list of startups eligible for angel tax exemption, based on their audited financial statements and income tax returns of the previous year. The government also decided to raise the maximum time limit below which a firm would be deemed eligible for angel tax exemption to 10 years from the earlier seven, a member of the committee set up to look into the issue said, speaking on condition of anonymity. This tax usually impacts startups and the angel investments they attract. While aimed at curbing money-laundering, the angel tax has also resulted in a large number of genuine startups receiving notices from the IT Department. The CBDT, however, said that it could not halt the proceedings in cases where the startups had already been sent a notice by the Income Tax department. A panel of State Ministers on Friday, February 8, 2019, favoured lowering GST on under-construction residential properties to 5%, from 12%currently. In its first meeting, the GoM also favoured slashing GST on affordable housing from 8% to 3%. Officials said the report of the GoM would be finalised within a week and would be placed before the GST Council in its next meeting. Currently, GST is levied at 12% with Input tax credit (ITC) on payments made for under-construction property or ready-to-move-in flats where completion certificate has not been issued at the time of sale. The effective pre-GST tax incidence on such housing property was 15-18%. GST, however, is not levied on buyers of real estate properties for which completion certificate has been issued at the time of sale. After Reserve Bank of India (RBI) lifted restrictions under prompt corrective action (PCA) on three public sector banks last week, Finance Minister PiyushGoyal said the government will try to help lift the restrictions on other public sector banks too. There are eight more public sector banks (PSBs) that are under the PCA framework after restrictions were lifted from Bank of India, Bank of Maharashtra and Oriental Bank of Commerce. While interacting with the business community at an event organised by industry body CII, Mr.Goyal said, “we will try to lift restrictions on other PCA banks soon,” when one industry body pointed out loan growth was impacted since many banks were under PCA. The government had infused capital in banks that was used to increase provisions and lower the net NPA ratio enabling RBI to lift restrictions on the three banks. Breaching net NPA ratio of 6% is one of the conditions that trigger restrictions. The 5th India-Bangladesh Joint Consultative Committee Meeting was held in New Delhi today. External Affairs Minister SushmaSwaraj and Foreign Affairs Minister of Bangladesh Dr Abdul Momen co-chaired the meeting. In a tweet, External Affairs Ministry spokesperson Raveesh Kumar said MrsSwaraj and Mr Momen took stock of progress in security, defence, trade and connectivity, development partnership, water, power and energy sectors and consular and cultural cooperation. The Rohingya issue dominated meetings that the Bangladesh Foreign Minister held here on Thursday with the Indian leadership. Interacting with Prime Minister NarendraModi, A.K. Abdul Momen, who is on his maiden trip to India, sought continued support in resolving the humanitarian disaster that has brought more than a million refugees to Chittagong. In Thailand, a princess will run for the Prime Minister post in March 24 elections in an unprecedented entry by a royal into frontline politics. This will pit her against the chief of the ruling junta and redrawing the nation's political landscape. Sixty-seven year old Princess Ubolratana, the older sister of Thai King MahaVajiralongkorn, was announced as a candidate for the Thai Raksa Chart party steered by the Shinawatra political clan. Thai Raksa Chart party leader PreechapolPongpanich told reporters that the board agrees that the name of Princess Ubolratana, an educated and skilled person, is the most suitable choice. Here was the challenge for bioengineers: find a way for patients to take drugs like insulin or monoclonal antibodies used to treat cancers and other diseases without injections. Now, a team of scientists may have found a solution that delivers these drugs in a capsule a person can swallow. The engineers decided to imitate the tortoise’s shape with a tiny device that would always land on the wall of the stomach. In n Brazil, 10 people were killed when a fire ripped through the training ground of Flamengo football club, in Rio de Janeiro. Three people were also injured in the fire. Rio's Deputy Governor, Claudio Castro said, preliminary information indicates there were young players and staff amongst the dead. According to a local newspaper, witnesses alleged that the fire started in the air conditioning system. An investigation has been launched into the cause of the blaze.